Please join us at our inaugural exhibition Incremental Loss by Melbourne based artist Robbie Rowlands. Rowlands manipulates the built environment to explore notions of stability and vulnerability, creating an immersive sculptural site intervention of epic proportions. Deconstructing the history of the grandiose 19th Century Union Bank, objects and spaces are transformed as Rowlands blurs the boundaries between past, present and future. 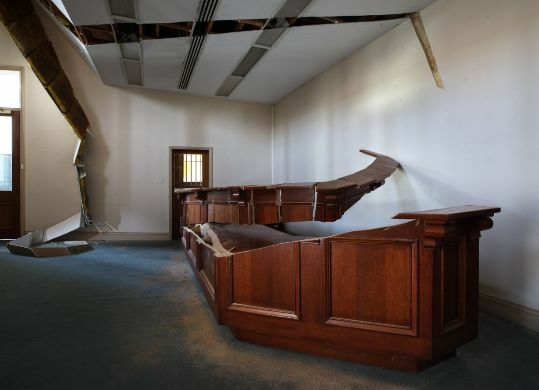 Image Credit Incremental Loss Front desk and ceiling cut, Former Union Bank, The National Centre for Photography Residency, 2019. Robbie Rowlands is represented by Blackartprojects. Don’t miss out, we’d love you to help us celebrate Ballarat’s very first exhibition in the National Centre For Photography. All welcome! We respectfully acknowledge the Wadawurrung and Dja Dja Wurrung people – traditional custodians of the land on which we live and work. Copyright © 2018 *Ballarat International Foto Biennale*, All rights reserved.